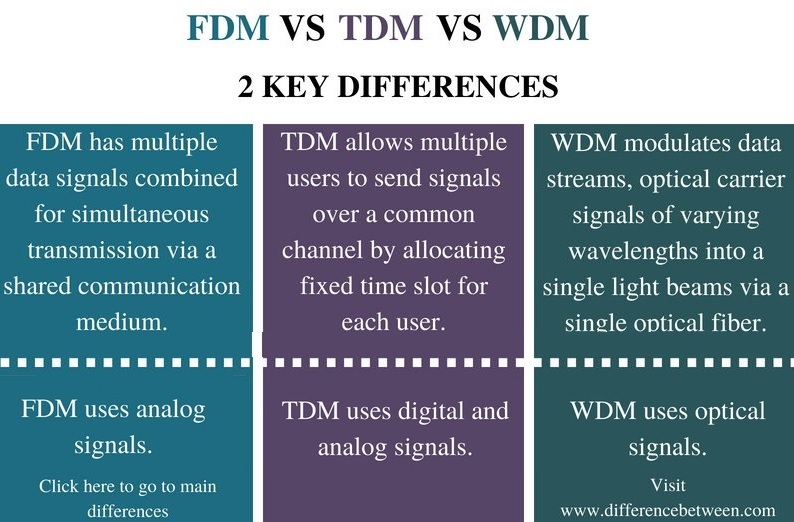 The key difference between FDM TDM and WDM is that FDM divides the bandwidth into smaller frequency ranges and each user transmits data simultaneously through a common channel within their frequency range. TDM allocates a fixed time slot for each user to send signals through a common channel while WDM combines multiple light beams from several channels and combine them to a single light beam and sends through a fiber optic strand similar to FDM. Data transmission is the process of sending data in the form of signals from the source to the destination. Multiplexing is a technique in data transmission. It is to take multiple signals and combine them to a composite signal so that it transmits over a signal communication channel. FDM, TDM, and WDM are three multiplexing techniques. Bandwidth is the total capacity of a channel to transmit data. In FDM, the complete bandwidth is divided among the users. Therefore, each user gets its own bandwidth or a frequency range. In other words, all users can use the channel at the same time but they have their own bandwidths or frequency ranges to transmit data. On the sending end, all the signals are combined to a single signal using a multiplexer. Afterward, the signal travels through the channel. On the receiving end, there is a demultiplexer. It separates the composite signal back to separate signals. One drawback of this multiplexing technique is that, since all signals transmit at the same time, there is a possibility of crosstalk. 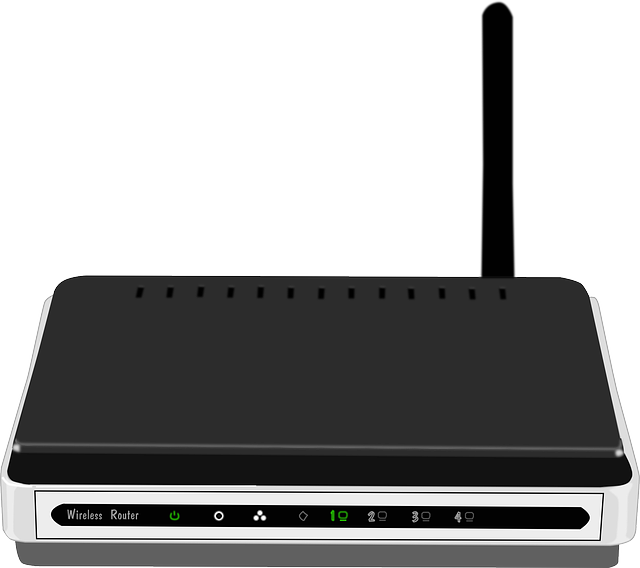 In brief, FDM divides bandwidth and provide frequencies for the users. It does not divide time among users. In TDM, the users can get complete channel bandwidth to send signals but for a fixed time slot. It scales the time among the users. 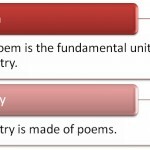 Assume that there are three users as u1, u2 and u3 and the fixed time slot is t0. First, u1 will get the entire frequency bandwidth for t0 time. When u1 transmit data, the other users cannot transmit data. After that time slot is over, u2 can transmit data for a t0 time. When u2 transmit data, the other users cannot transmit data. Then, u3 transmits data for t0 time. In brief, TDM divides time not the bandwidth among users. They can only transmit signals within the available time slot. As only, one signal transmits at a time, the crosstalk in TDM is minimum. Fiber Optic communication use WDM. The concept of WDM relates to Physics. When a white light beam goes through a prism, it separates into individual colored light beams by the prism. Each light beam has different wavelengths. This scenario works vice versa as well. The individual color beams combine back to generate a white light beam. WDM combines multiple light beams from channels using a multiplexer and sends them as a single light beam through an optic fiber strand. On the receiving end, the demultiplexer separates the single light back into multiple light beams and sends them to their own channels. Overall, WDM is similar to FDM but, the transmission occurs through fiber optic channels. Therefore, the multiplexing and demultiplexing involve optical signals. What is the Difference Between FDM TDM and WDM? FDM is a transmission technique in which multiple data signals are combined for simultaneous transmission via a shared communication medium. TDM is a transmission technique that allows multiple users to send signals over a common channel by allocating fixed time slot for each user. WDM is a transmission technique that modulates numerous data streams, optical carrier signals of varying wavelengths into a single light beams through a single optical fiber. FDM divides the bandwidth into smaller frequency ranges antransmitsser transmit data simultaneously through a common channel within their frequency range. TDM allocates a fixed time slot for each user to send signals through a common channel. User gets the entire bandwidth within that time slot. WDM combines multiple light beams from several channels and combine them to a single light beam and sends through a fiber optic strand similar to FDM. FDM stands for Frequency Division Multiplexing. TDM stands for Time Division Multiplexing. WDM stands for Wave Length Multiplexing. FDM uses analog signals. TDM uses digital and analog signals. WDM uses optical signals. The difference between FDM TDM and WDM is that FDM divides the bandwidth into smaller frequency ranges and each user transmit data simultaneously through a common channel within their frequency range, TDM allocates a fixed time slot for each user to send signals through a common channel and WDM combines multiple light beams from several channels and combine them to a single light beam and sends through a fiber optic strand similar to FDM.